The Irish terrier is one of the oldest breeds having originated in Ireland during the 1700s. This breed is a greater hunter and excels in exterminating den animals and in the past has been used as a wartime messenger and retriever. They were never liked by the nobles but have always been admired by the Irish farmers for their work, guarding abilities and friendliness. This breed is medium in size and is agile, lively and has a grand appearance. Because of their energy and bravery they can fight any enemy and thus are often referred to as a daredevil. Along with being brave, they are also adventurous and hot tempered. They are dedicated, adoring and loving to their family. This breed in general is best with older mature children and house with no other pets. Although they make an excellent guard dog because of their protectiveness towards family, home and territory, they are not recommended for in experienced or new owners. The Irish terrier is brilliant but is at the same time quite stubborn. It needs to be trained at an early age in order to ensure discipline and respectfulness. While training a firm, just, consistent, and devoted attitude must be adopted as the dog does not respond to strict or unjust methods. This breed is outstanding in hunting, retrieving, guarding, tracking and may also be used for police and military work. However, they need regular brushing in order to reduce shedding and remove dead hair. Bathing needs to be done only when extremely needed and a mild shampoo must be used in order to not cause harm to the coat. This breed is robust and active and needs regular exercise. They should not be left alone for extended periods of time and a lot of attention should be given to them as otherwise they may become bored and cause damage. Even though it is advisable for houses which have open space, but it may even do well in an apartment provided it is given enough exercise. 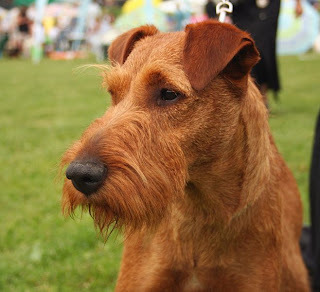 The Irish Terrier in general is a healthy breed and lives for 13-14 years. However, some of them are prone to thyroid problems.